36 years of coaching football all within the South Haven School District Football program. Record: 188-123-5. Has coached 131 teams in South Haven's athletic program. Coached in 2722 contests in four combined sports. Conference champions in 2007 (South Haven's first Conference Championship in 23 years.) MHSAA Playoff Qualifier in 2007 (South Haven's first appearance in 30 years.) Olivet College Athletic Hall of Fame Inductee, 1978. Michigan High School Baseball Coaches Association Hall of Fame Inductee, 1993. Bangor High School Athletic Hall of Fame Inductee, 1997. Michigan High School Coaches Association Hall of Fame Inductee, 2003. U.S. Army Decorations include The Congressional Medal of Honor, 3 Bronze Stars, 2 Purple Hearts, Combat Medic Badge, Presidential Unit Citation, Vietnam Cross of Gallantry with Palms, Vietnam Campaign Medal, Vietnam Service Medal, National Defense Medal. Retired from coaching in 2008. Written by: Todd Spangler: 703-854-8947 or at tspangler@freepress.com. WASHINGTON — President Donald Trump said today he will award the Medal of Honor next month to a retired west Michigan high school teacher and coach who as a medic is credited with saving the lives of 10 members of his platoon during the Battle of Nui Yon Hill in Vietnam nearly 50 years ago. Trump will present the nation’s highest military award to James McCloughan, a 71-year-old resident of South Haven, at a ceremony in Washington on July 31. The award comes in the wake of a measure passed last year by Congress waiving the time limit in which the award could be given. It was signed into law by President Barack Obama before he left office. "We are forever grateful for then-Private First Class James McCloughan’s service to our country," U.S. Sen. Debbie Stabenow, D-Mich., said. "Today, we are proud to announce that he is finally getting the recognition he deserves." As the Free Press previously reported, McCloughan, who could not be immediately reached, was a 23-year-old medic who, over the course of a bloody, two-day battle in May 1969 near Don Que, returned to the battlefield multiple times to retrieve wounded soldiers despite being hit with shrapnel from a grenade and being shot in the arm. McCloughan, who was drafted into the Army after graduating from Olivet College with a bachelor of arts in sociology and a teaching certificate, spent nearly four decades after returning to Michigan teaching psychology, sociology and geography at South Haven High School and coaching football, wrestling and baseball. He is a member of the Michigan High School Coaches Hall of Fame. "This is not a James McCloughan award, it’s an award for my men, for Charlie Company," McCloughan told the Free Press last year when Congress was moving toward authorizing his receiving the award. "We had a horrendous battle, a situation you will never forget. … I wasn’t going to leave my men, and they were going to protect me." McCloughan — who rose to the rank of specialist 5 — has already received numerous decorations associated with his bravery, including the Combat Medical Badge, two Purple Hearts and two Bronze Stars. But his receiving the Medal of Honor was hampered by rules that it had to have been awarded within five years of the actions that warrant it. Some years ago, McCloughan’s old platoon leader, Randy Clark, began an effort to have the Pentagon review whether he should still receive the award. Former Defense Secretary Ashton Carter decided he should but said that Congress would have to act to waive the time limit. It did so as part of a defense authorization act passed last December. Speaking to the Free Press last year, McCloughan vividly remembered the battle, which he said his own commander considered ill-advised because they did not know the enemy’s strength, which turned out to be far greater than their own. Of the 89 soldiers flown in by helicopter to try to block a North Vietnamese advance, 32 returned — with 12 killed and the rest wounded or missing in action. SUMMER SALE IS ON NOW. McCloughan said despite grenade wounds, he refused to leave the battle in which platoons he served with ran into multiple ambushes. As a medic, he dashed back and forth to treat and try to rescue the wounded as machine gunners tried to spray protective fire to keep him from getting killed. "James McCloughan risked his life to stay behind in the heat of battle and aid his fellow service members," said U.S. Sen. Gary Peters, D-Mich., a member of the Senate Armed Services Committee. "He exemplified the values of honor, courage and camaraderie that makes our military the finest in the world." "His selfless actions saved lives," added U.S. Rep. Fred Upton, R-St. Joseph, whose district includes South Haven. "When he was done serving our country, Pfc. McCloughan quietly returned home to South Haven, where he dedicated his life to helping others. ... It’s time he finally receives the recognition he duly earned on the battlefield all those years ago." Details of the award ceremony — other than the fact that it will take place at the White House — have not yet been released. In its announcement, the White House noted that in order to receive the award, "the meritorious conduct must involve great personal bravery or self-sacrifice so conspicuous as to clearly distinguish the individual above his or her comrades and must have involved risk of life." WASHINGTON (AP) — An Army medic who "ran into danger" to save wounded soldiers during a Vietnam War battle despite his own serious wounds on Monday became the first Medal of Honor recipient under President Donald Trump, 48 years after the selfless acts for which James McCloughan is now nationally recognized. McCloughan mouthed "thank you" as Trump placed the distinctive blue ribbon holding the medal around the neck of the former Army private first class. As the president and commander in chief shook McCloughan's hand, Trump said "very proud of you" before he pulled the retired soldier into an embrace. "I know I speak for every person here when I say that we are in awe of your actions and your bravery," Trump said, describing McCloughan's actions for a rapt audience that included numerous senior White House and administration officials. Among them were Defense Secretary Jim Mattis, Veterans Affairs Secretary David Shulkin and retired Marine Gen. John Kelly, sworn in earlier Monday as the new White House chief of staff. McCloughan said in a brief statement on the White House driveway after the ceremony that it was "humbling" to receive the medal. Now 71, he pledged to do his best to represent the men who fought alongside him "as the caretaker of this symbol of courage and action beyond the call of duty." 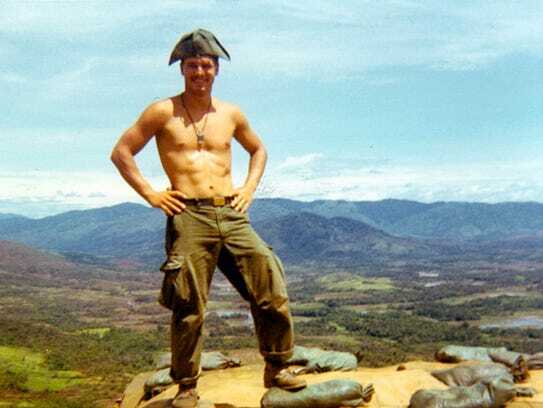 Drafted into the Army, McCloughan was a 23-year-old private first class and medic who in 1969 found himself in the middle of the raging Battle of Nui Yon Hill. McCloughan willingly entered the "kill zone" to rescue injured comrades despite his serious wounds from shrapnel from a rocket-propelled grenade. In announcing the honor last month, the White House said McCloughan "voluntarily risked his life on nine separate occasions to rescue wounded and disoriented comrades. He suffered wounds from shrapnel and small arms fire on three separate occasions, but refused medical evacuation to stay with his unit, and continued to brave enemy fire to rescue, treat, and defend wounded Americans." "He ran into danger," Trump said. McCloughan, who lives in South Haven, Michigan, told The Associated Press in an interview last month that the battle was "the worst two days of my life." He described the shrapnel as "a real bad sting" and recalled, "I was tending to two guys and dragging them at the same time into a trench line." He said he looked down to see himself covered with blood from wounds so bad that they prompted a captain to suggest he leave the battlefield to seek treatment. 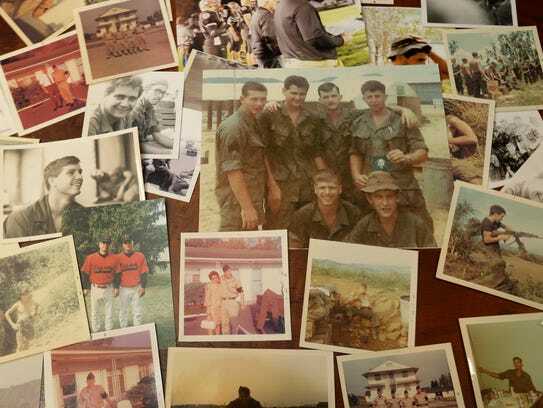 McCloughan left the Army in 1970 and spent the next several decades teaching psychology and sociology and coaching football, baseball and wrestling at South Haven High School. He retired in 2008.